Finally you can control all your smart home devices from one central spot in your home. Being a fully fledged Android Touch Table, the fun doesn’t stop there. With over 2 Million apps waiting for you in the Google Play Store, the TC32 smart coffee table becomes your personal infotainment hub. But the TC32 is not only for homes. In fact it was born by B2B demand. Think lounge areas in restaurants, hotels, airports, exhibition spaces and flagship retail stores. Together with it´s bigger brother – the TC55 – all TableConnect touch tables are the perfect opportunity to entertain and inform your clients and guests. The exclusive line of TableConnect Multi Touch Tables is available worldwide for rent and sale. Our Multitouch Tables include everything you need. From the UHD “4K” touchscreen to the powerful Android hardware. From it´s iconic shape to the premium materials – this touch table is more than just an electronic gadget. 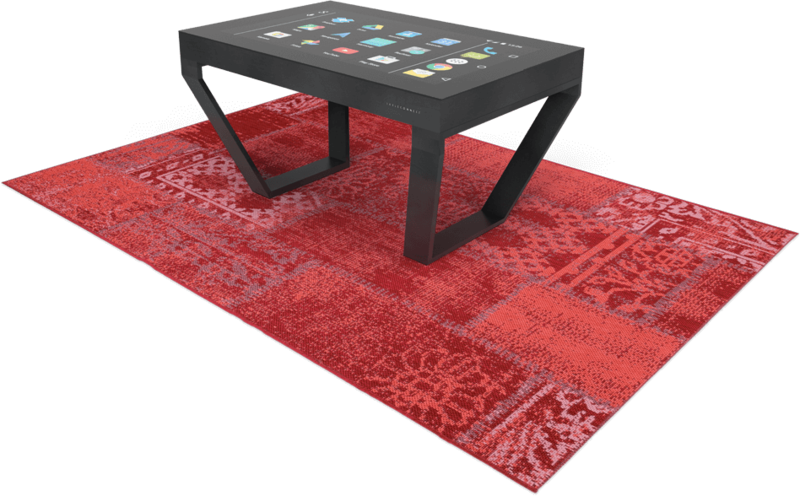 With industry leading touch response and Snapdragon CPU this smart coffee table feels as snappy as your smartphone. Conceived by former AKG audio engineers, the internal speakers easily fill your living room with your favourite Spotify, Amazon Music, Tidal or Pandora tracks. Spilled your drink? No need to worry – just wipe the seamless glass surface clean and you are good to go. The touch table will go into power-saving standby after a user-defined period. A quick tap anywhere on the screen wakes it up again. The TC32 connects to almost everything via WiFi and Bluetooth. Chromecast, Bluetooth Speakers, Smart TVs, Philips Hue and many more devices. Simply connect the power cord and you are good to go. It could not be any easier! While smartphones and Tablets are personal devices, the TC32 smart coffee table is ment to share your experiences and bring everybody together. Weather it´s planing your next vacation, viewing your latest holiday photos, picking your next Netflix movie, being the Spotify DJ(ane) for your party or simply playing one of the hundreds of games with your kids. Everything is more fun together! Surely you´ve spent a great deal of time designing your living room and we made sure our products look and feel worthy of a place in your home. All TableConnect touch tables share a unique iconic design language and the most high quality materials available. The precision milled high-grade aluminum body with a black anodized finish looks and feels high quality from top to bottom. This is design and technology in harmony. Works out of the box with your favourite entertainment apps and games like Spotify, Amazon Music, Tidal, Netflix, Amazon Prime Video, Flipboard, Soundcloud, Angry Birds, Clash of Clans and many more. Any smart home system sporting an app works on TableConnect touch tables: Philips Hue, Logitech Harmony, Lifx, Sonos, SmartThings, Wemo, Nest, Ecobee, iRobot, Loxone, Homematic IP, Gira, KNX, Samsung Smart Home, Lutron and many more. From Entertainment to Smart Home control – enjoy all your favourite apps on one unified device.